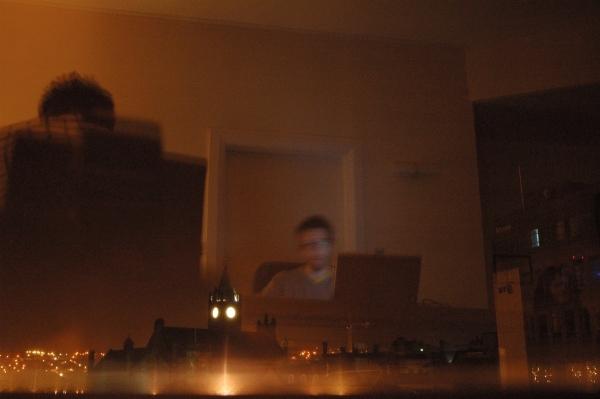 An improvised sound-performance in Derry. The anti-tours project emerged initially from a consideration of the four space-specific sound-performances in Brazil that formed part of http://alpha60.info, my project for the 2004 São Paulo Bienal. The changes in my own attitude to recorded music were another important factor. A call out for participants was circulated locally. I was interested in the development that was taking place along the banks of the river Foyle at the time. In the end, there was one performance in a room at The City Hotel overlooking the spot in the river where The Peace Bridge was unveiled in 2011.
anti-tour no. 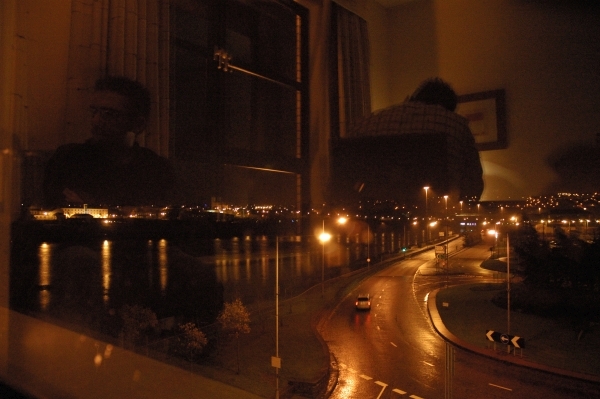 4 - the foyle was a SFFF/VOID co-production, with the support of BBC Radio Foyle and The City Hotel, Derry. This work is discussed in The Cinematic Condition by Chris Fite-Wassilak, a text which was commissioned for OBSCURE FLOWS BOIL UNDERNEATH. Images courtesy Paola Bernardelli and VOID, Derry.